A beautiful good bye to Playa La Barqueta. Sunrise from our bedroom as we pack for the days journey. 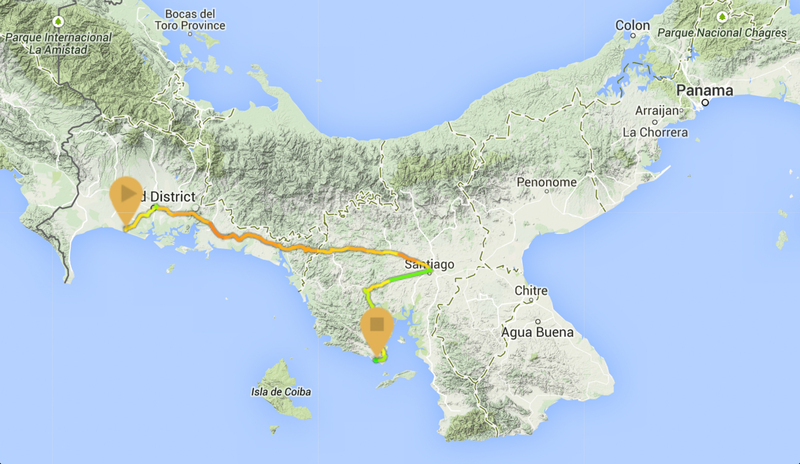 Map of our bus trip from Playa La Barqueta to Santa Catalina. What an experience! 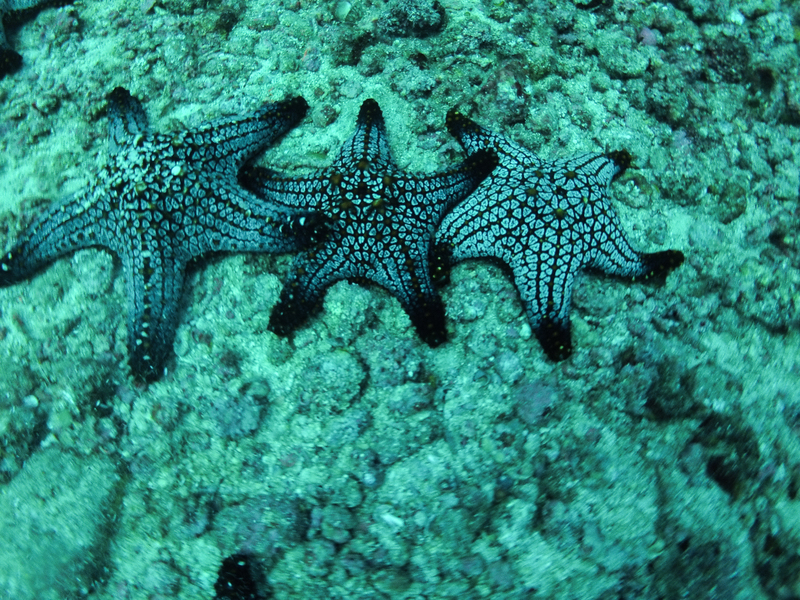 Karen and I booked a three day diving trip to Coiba Island, reported to be some of the best diving in Panama. The whole adventure started with a flawless bus trip that involved three different buses and a taxi trip between bus terminals in Santiago (Total travel time was just under 9 hours). Sometimes you will hear people complain about how slow things happen in Central America, or the lack of customer service (which are both true at times we have found), but when it comes to bus travel I have yet to experience a better system. It is true, when you first look at a bus terminal you can’t imagine ever finding the bus you want, or that it will ever leave on time (it probably won’t, get over it). But once you start asking directions, we have found people go out of their way to help you get to the right bus. It is not that they always come across as being happy about helping you (You are probably the 10th gringo that day to stumble up lost and confused asking for help in a foreign language). But none the less they at least point you in the correct direction. Just a note on that. If your experience is that the locals are consistently pointing you in the wrong direction perhaps you need to take a critical look at your demeanour when asking for assistance, just my personal opinion. 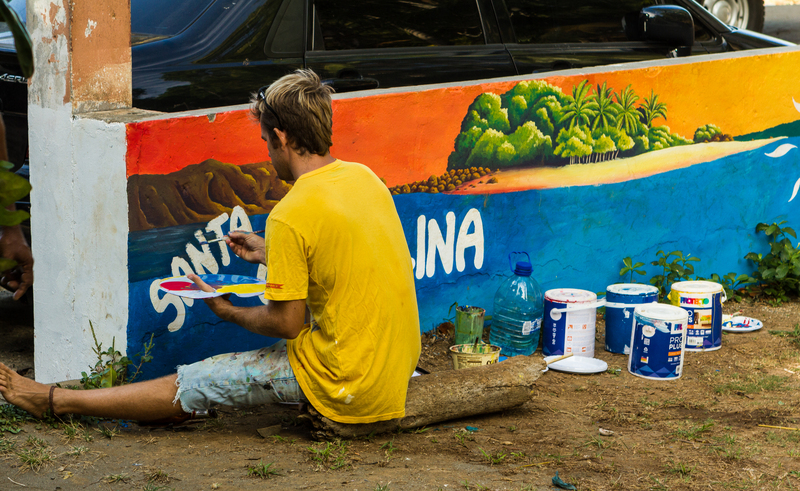 Santa Catalina is an “at the end of the road little surfing town” on the Pacific coast of Panama. If you don’t like things “rustic” and don’t surf or dive you may want to check out other vacation destinations. But if you enjoy a bit of adventure and a very social atmosphere, this is a great little town. 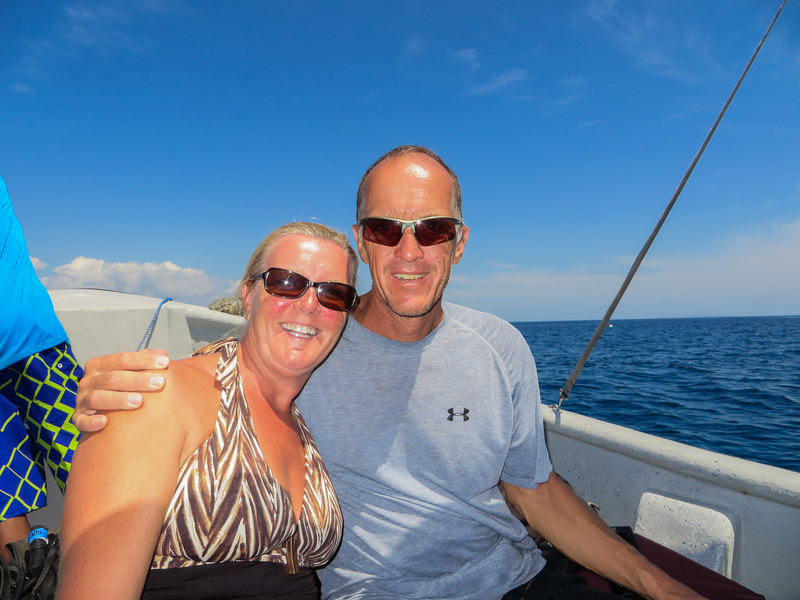 We found some fantastic restaurants and the diving ……more on that to come. 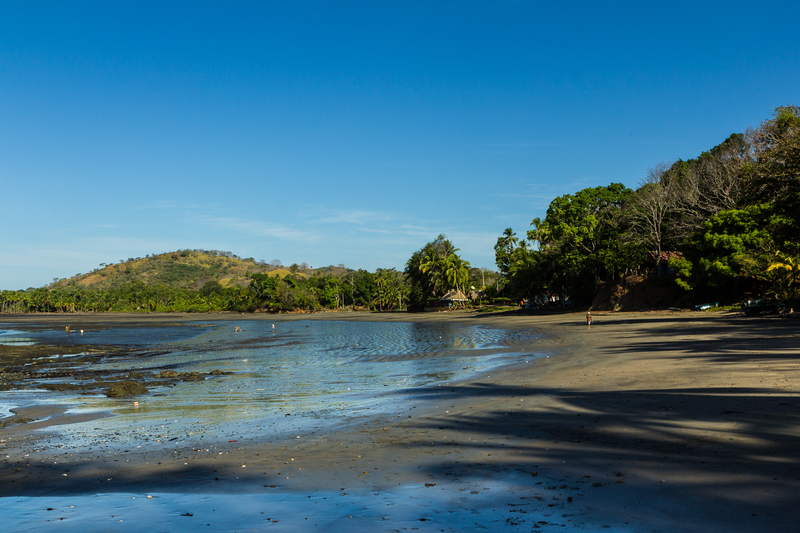 A view across the Santa Catalina beach at low tide. An artist sprucing up the sign for one of the many tour providers in town. We spent our first night in Santa Catalina at the Santa Catalina Hotel. It was a bit of a rough beginning and I admit to losing my “Zen” for a bit (Karen was able to send me outside while she dealt with things). But all was resolved and the two nights we spent there after the dive trip were uneventful. 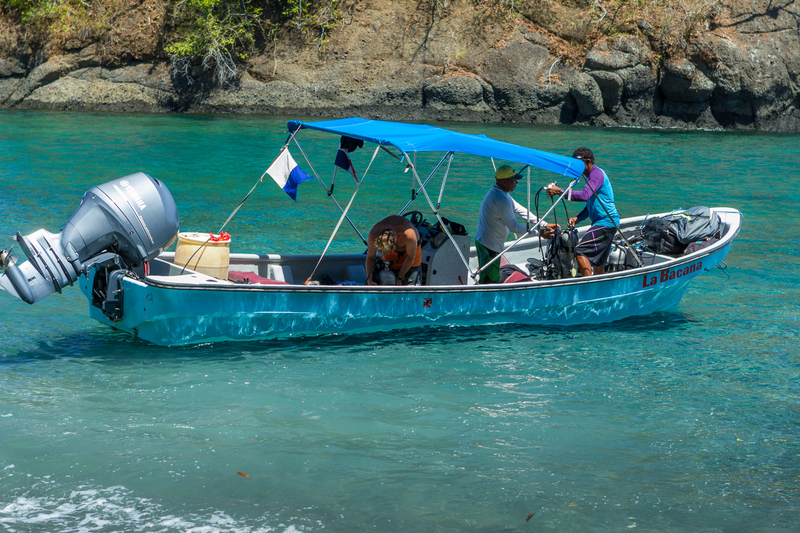 The tour company we chose to go with was Scuba Coiba, owned by Herbie Sunk. 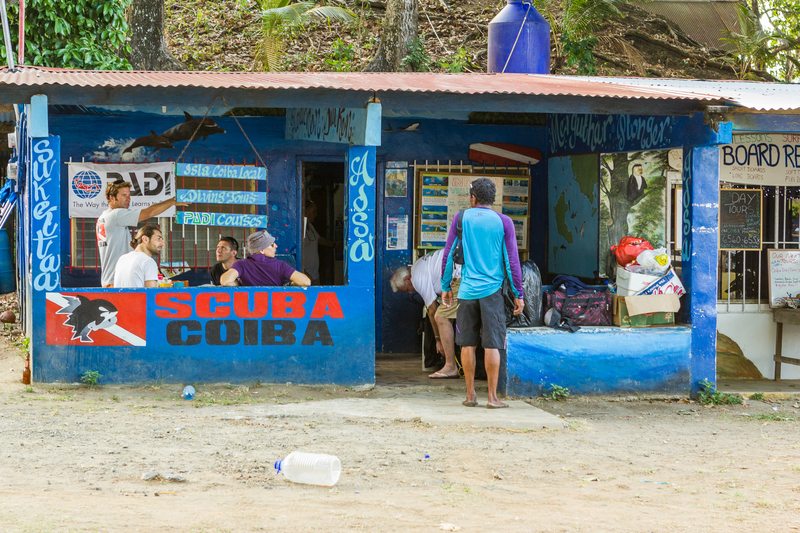 Scuba Coiba’s shop, right by the beach in Santa Catalina. We rent all of our gear when diving, as hauling all that equipment around the world is simply not worth the aggravation and cost, we believe. I know there are lots of divers that don’t agree with that, but…… they’re wrong. The gear we got was in good repair, and the one regulator that Karen had for her first dive that wasn’t working quite right for her first dive was immediately replaced for the second dive. Not something you can always do when you only have your own gear to work with. Our Dive Master, Nick, was very good. Before all dives we received a briefing and knew whether we needed to stick with him or if it was ok to go exploring by ourselves. The two man crew on the dive boat were very good and had the equipment ready to go at the beginning of every dive. The only criticism I had was the Captain was transfixed with always using full throttle when travelling between sites. The surface conditions did not always concur with that speed which made for some rough rides occasionally. Nick and the crew in our dive boat preparing equipment. We dove for three days at a variety of sites. 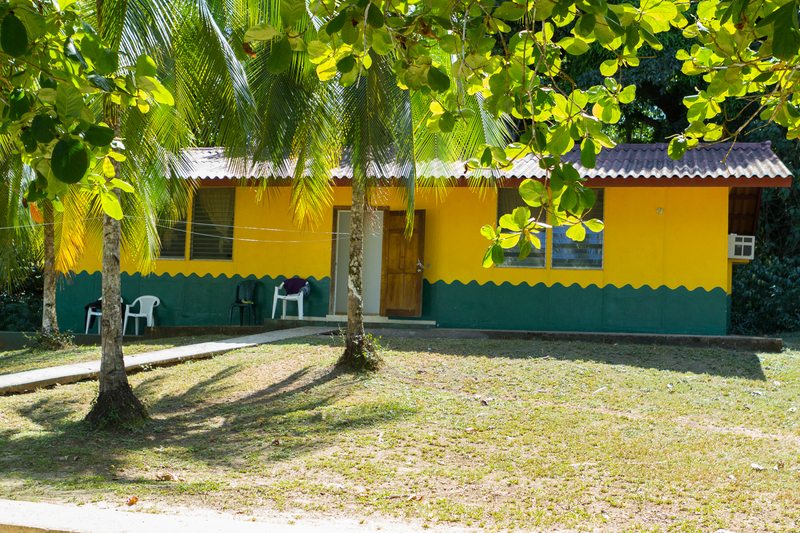 Our two nights were spent in cozy dorm style bunk houses on Coiba Isla. 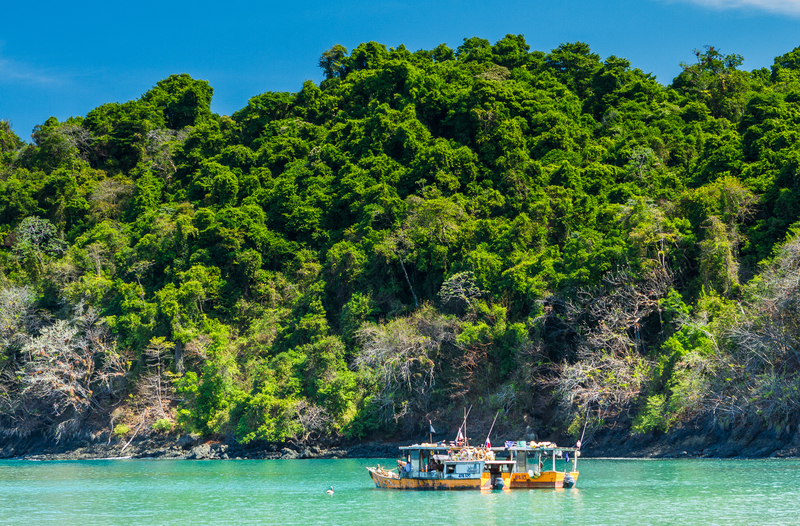 It used to be a prison but was declared a Protected Area and has been transformed into a eco destination over the years. 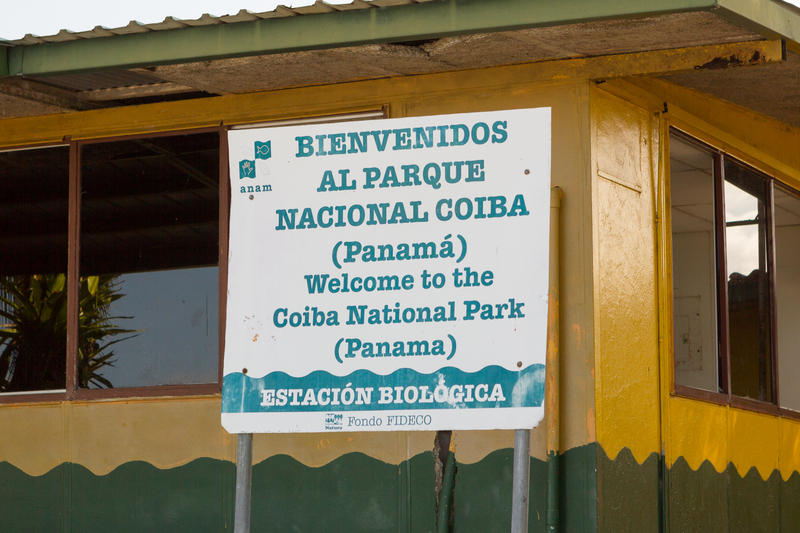 Welcome to Coiba National Park. The accommodation is advertised as very spartan and basic dorm rooms. They deliver exactly what is advertised. However, it was clean, the washrooms could use some work, and the rangers turned on a generator at night that allowed you to recharge batteries and have air conditioning (if all occupants of the room could agree) all night, which I thought was an amazing luxury. Our humble home away from home for two nights on the island. The diving….was spectacular. It was more challenging than anything Karen or I had done before which was fantastic. It allowed us to improve our skill set and confidence while enjoying some of the most amazing schools of fish we have ever seen. As well as seeing lots of White tip reef sharks (I know, to experienced divers you go, yawn, however, still cool to see for the first time) as well as Moray eels in numbers and variety that left us shaking our heads in wonder. Also diving with divers with much more experience than I allowed me to come to grips with and accept that I truly am an “air hog” and will nearly always be the first one surfacing during a dive. Humility is a good thing in some activities, it helps keep you safe. 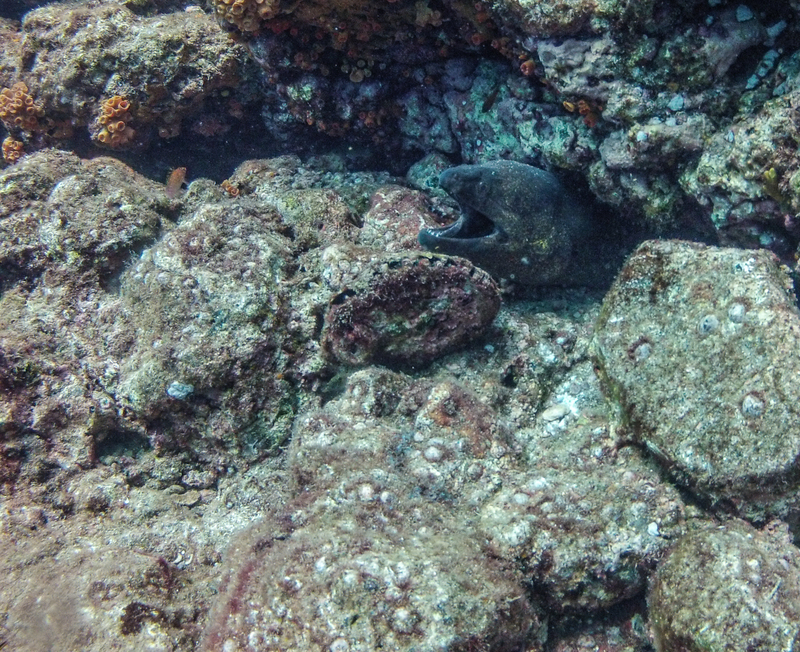 One of the dozens of Moray eels we encountered on our dives. We came upon a field of starfish. I was partial to these cuddling ones. 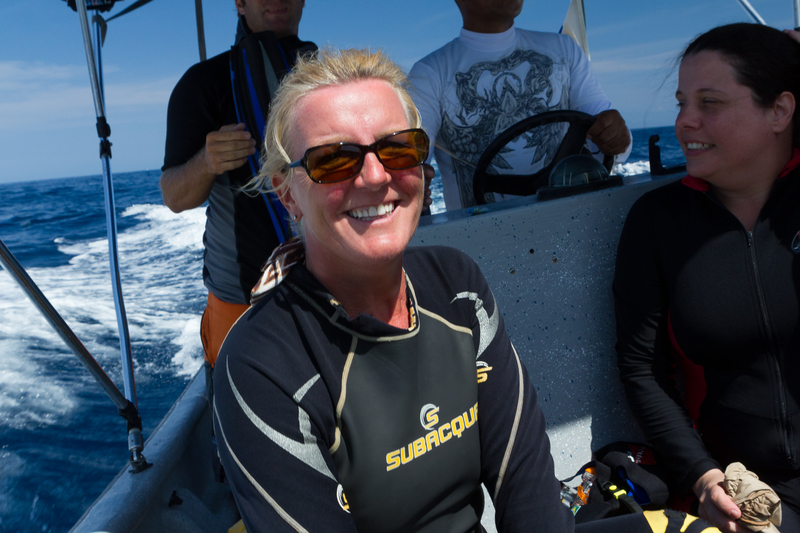 Karen all smiles as we head for another dive site. Still smiling after 3 days of diving. 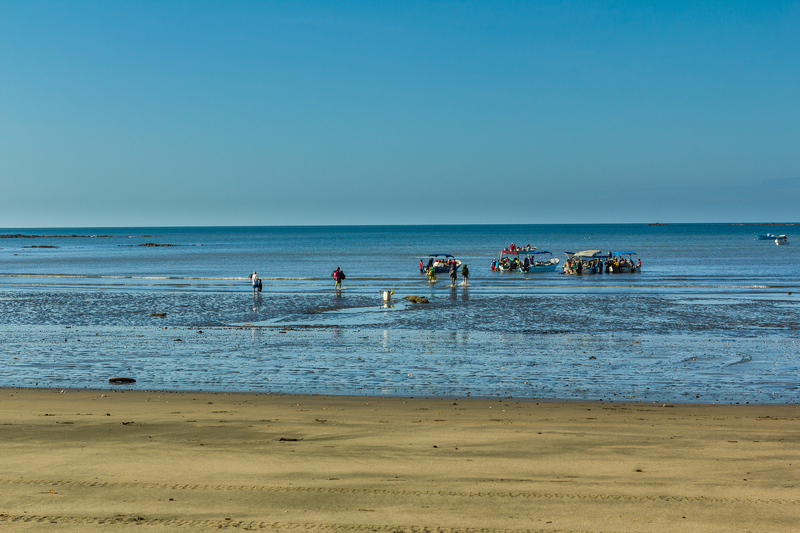 Some fishermen enjoying some down time in a secluded bay. We did not get much of a chance to explore the island. However we did meet the resident crocodile (a solid 3 metres long) as well as Black Vultures truly comfortable with interacting with humans, rather disturbing at first. This fellow lived just behind our bunk houses. 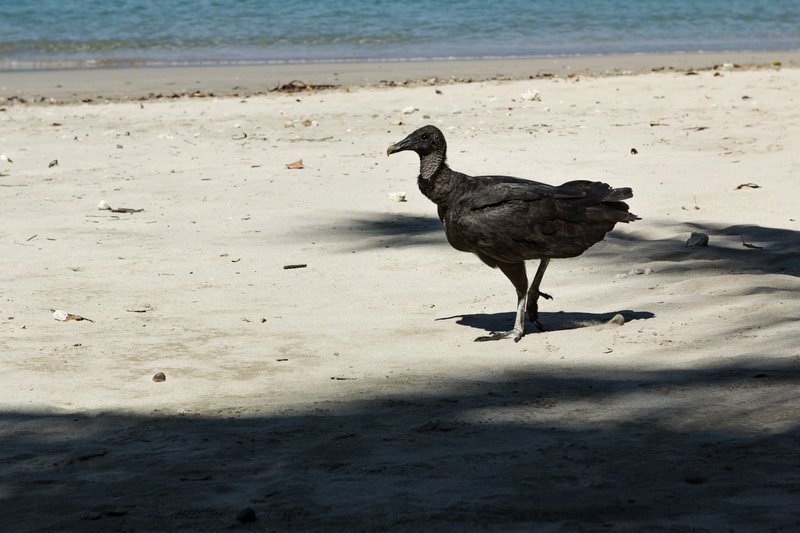 Vultures working hard to keep the beach and kitchen area clean. One of the things I had never really thought about before was the effect visiting cruise ships have on a small locale. 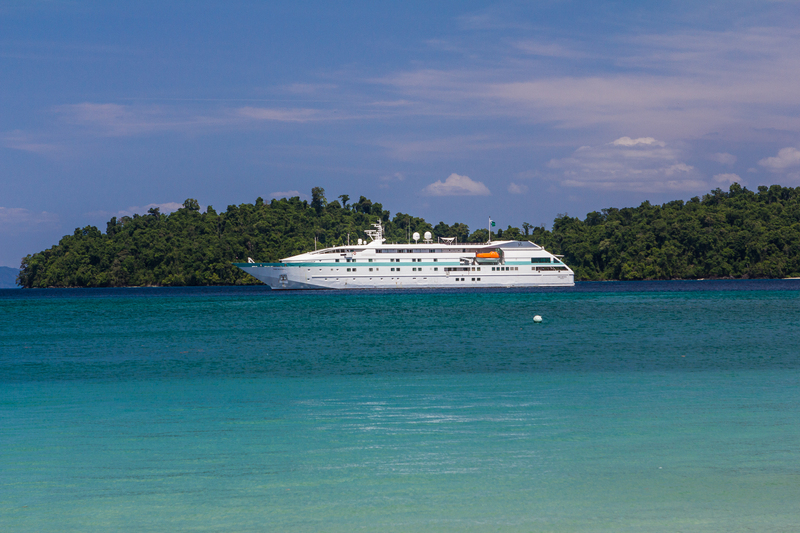 We happen to be on the island for two of the days a week that small cruise ships stop there. Wow! It is incredible to watch the landing party from the ship hit the beaches before any of the passengers are even awake and transform a third of the beach into a little “Club Med” for lack of a better term. The nice thing is these workers from the ships rake the garbage on the beach, tidy up the public restrooms and put toilet paper and soap out for the users of the washrooms. It is almost surreal watching the passengers come ashore and do their activities under the watchful eye of the ships crew. Don’t get me wrong, I have done a couple of cruises and loved them. I just never had the opportunity to see all the work that goes into transforming a primitive site into a luxury spot in such a short period of time. It is quite amazing. Paul Gauguin ship arrived on the second day of our stay. 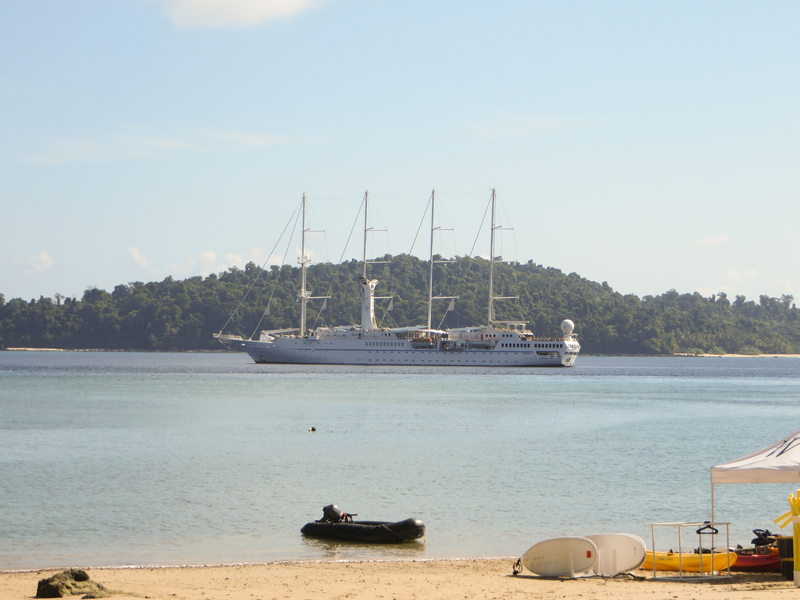 Windstar Cruises arrived on our third day. 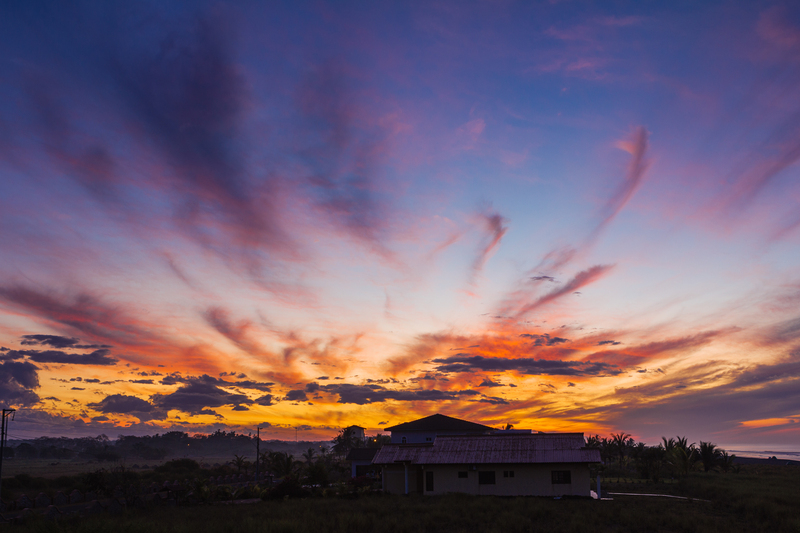 Panoramic sunrise shot from the lookout just above our settlement on Coiba. Our last day was spent exploring Santa Catalina. We borrowed some bikes and peddled the short distance to Playa Estero. It is well worth the short trip. It is a beautiful beach at low tide. There are several wonderful restaurants and bars in town to check out during a stay there. 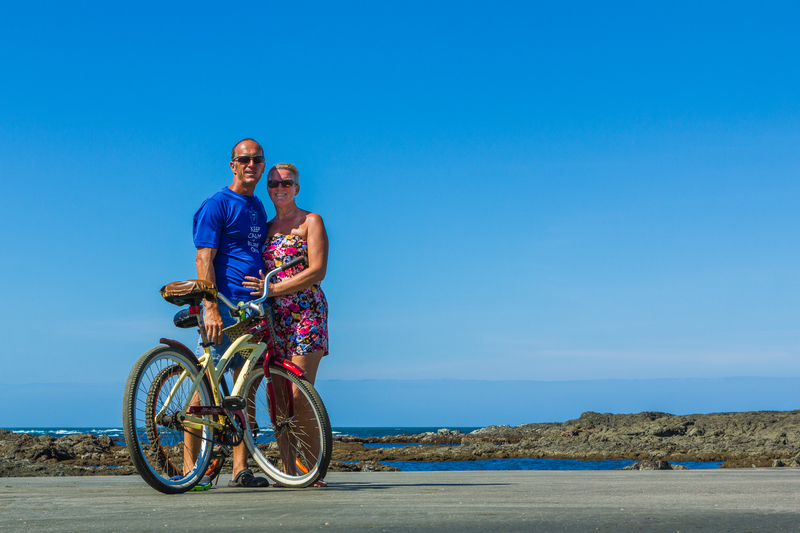 Posing with our bikes on Playa Estero. The tour boats on Santa Catalina beach loading up for the days tours. Off to Panama City next. Very excited for this next adventure. Well written buddy. Sounds like a great adventure. Wicked pictures tho. It was a lot of fun Bryce. Some lube would have been good for getting the wetsuits on and off constantly but we were able to overcome that. Glad you enjoyed the blog.